Dozens of enemies fall to Guan Yu's mighty blade. A Hack and Slash game resembles a Third-Person Shooter, but instead of blasting away enemies with a gun, the main hero of the game wields more primitive, close range melee weaponry. This genre resembles a third-person Adventure Game whereby the hero has a goal to accomplish. But the real goal of the mission level is just to kill as many enemies as possible. To increase the hero's casualty potential, the setting of the game may include large armies, and having the hero serving in one of them. Most of the enemies encountered on the field will be one-hit-and-they're-dead grunt soldiers, but occasionally, tougher bosses will show up, usually officers and generals. Since randomly killing large groups of enemies can become boring, most Hack and Slash games will often incorporate other genre elements into their gameplay. For example, the game may include a multi and single-player Fighting Game mode wherein players can pick characters from the game and have them square up against each other in a tournament setting. They can also incorporate story modes which provide more of an Adventure Game feel. The Stylish Action genre is more or less an offspring of the Hack and Slash genre born out of making the fights as cool and awesome as possible (not to say that regular hack and slash games can't look cool and awesome, they definitely can). Meanwhile, Role-Playing Games with a Hack and Slash component have been around since Action RPG titles like Dragon Slayer and Hydlide in the 1980s, and it is a mainstay of many Wide Open Sandbox games. Action-Adventure games can have levels that are purely Hack and Slash built into them to mix up the game play a little — and oftentimes, just to help the gameplayer relieve a bit of stress. A related genre can be found in the Beat 'em Up, where the action is more oriented towards punching, kicking, headbutting, and so forth. Cyber Troopers Virtual-On MARZ is a Humongous Mecha Action-Adventure version. Dead Meets Lead is a Top-Down View version. Devil May Cry — also codified the Stylish Action genre. Devil's Third, it doubles as a Beat 'em Up and a Third-Person Shooter with first-person shooter aiming. 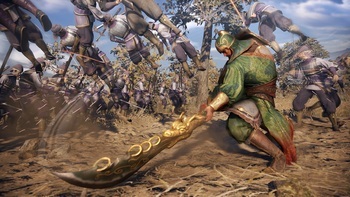 Dynasty Warriors, set in Three Kingdoms China, along with its many crossovers and spinoffs. Naruto Shippuden: Ultimate Ninja Storm 3: The Hack and Slash-styled gameplay of the Ultimate Ninja Impact game for the PlayStation Portable has been carried over to this game for story battles. Yaiba Ninja Gaiden Z a Spin-Off of the series. Mark of Kri and Rise of the Kasai are a mix of this and a Stealth-Based Game.